ALSTONE : Marriages 1550-1650, 1661-1731, 1756-1805: Phillimore's parish register series, vol. 22 - Worcestershire, vol. 1 [CD-ROM] IN: Phillimore's parish register series, vol. 22 - Worcestershire, vol. 1 Published London : Phillimore & Co Ltd, 1901 Author Phillimore, W P W ed. Author Carter, W F ed. FreeREG is a new project. The database currently contains a few million records only, so you should not expect to find all your ancestors in the database. 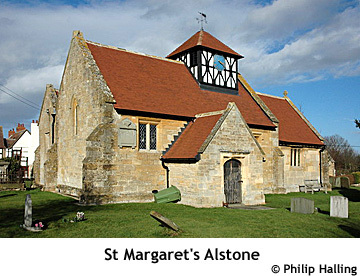 ALSTONE (St. Margaret) : Monumental Inscriptions: Gloucestershire monumental inscriptions, vol. 18 [Manuscript.] IN: Gloucestershire monumental inscriptions, vol. 18 Published , 1999 AuthorCooper, Keith et al. (trans.) Source D: Gloucestershire FHS. ALSTONE, a chapelry in the parish of OVERBURY, middle division of the hundred of OSWALDSLOW, county of WORCESTER, 6½ miles (E. by S.) from Tewkesbury, containing 79 inhabitants. The chapel is dedicated to St. Margaret.